Conflicts arise when wildlife causes damage to human property. Some animals may seek shelter inside of homes and barns. 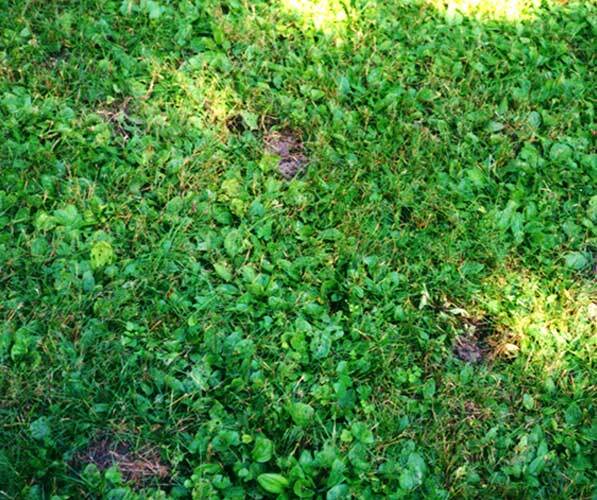 Other animals may cause damage to lawns, plants, or trees. The first step to managing wildlife damage is to figure out what animal is causing the damage. 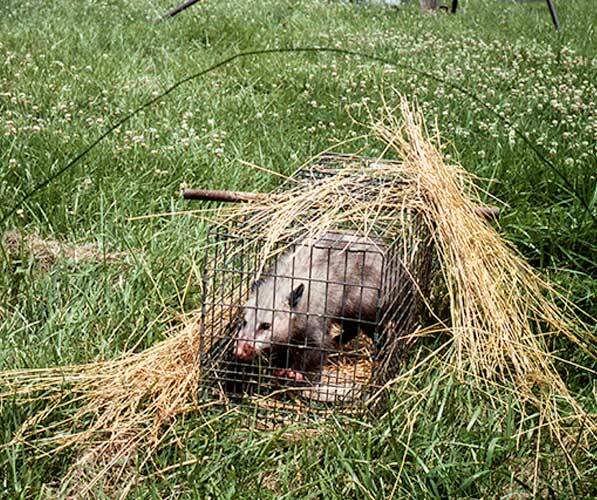 From there, one can find out what methods can be used to remove the wildlife. If you are unsure what animal is causing damage, try the filter below. This filter lets you select what type of damage you are experiencing and then shows which animals can cause that type of damage. The resources provided for each animal will help determine how to resolve wildlife conflicts. Droppings are the most common sign that bats are present. Droppings are 1/8 - 1/4in long, black, and dotted with speckles. 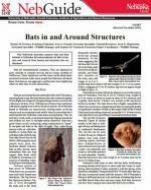 Bats can enter through openings as small as 3/8in. The presence of smudges and rub marks near eaves, vents, chimneys, cracks, and other openings is also an indicator. 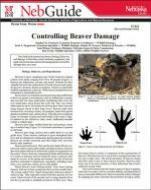 Beavers can cause damage through cutting down trees and creating dams that lead to excess water and flooding. Fooding can lead to further problems of crop loss and property damage. Beavers prefer to take down trees 2in - 6in in diameter, but are capable of cutting down trees up to 3ft in diameter. They also harm trees by stripping the bark off of them. 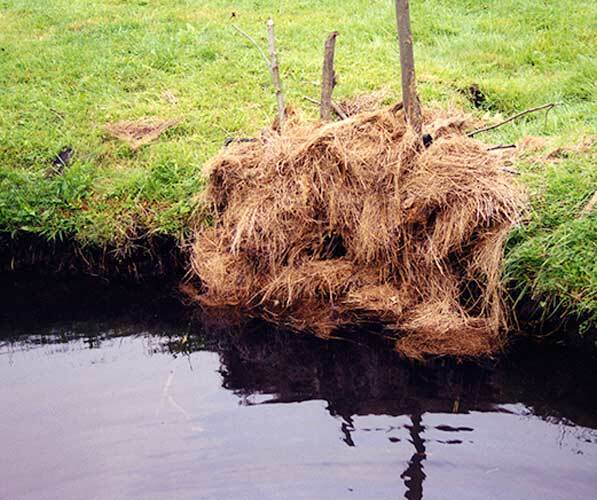 Beaver dams vary in size and can be made from tree limbs, branches, mud, rocks, cornstalks, and even trash. Birds can cause damage to fruit by pecking, slashing, and consuming whole fruits. 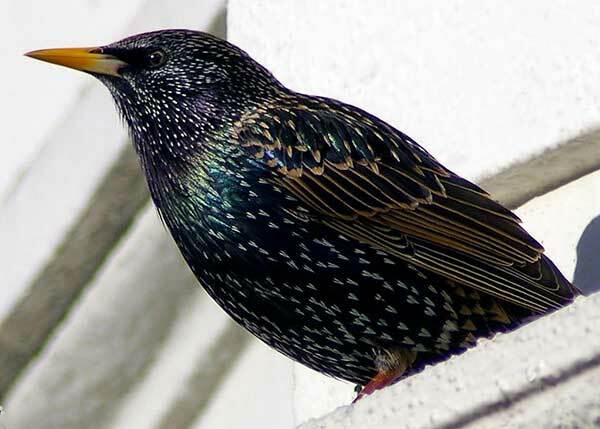 Some birds will consume grain intended for livestock and contaminate food with their feces. 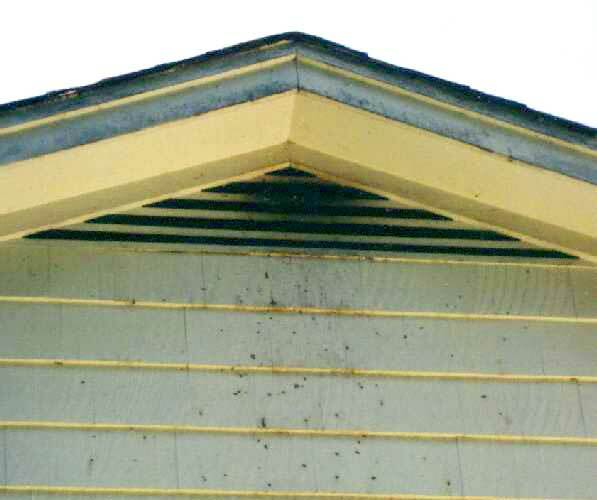 Droppings are acidic and lead to accelerated building deterioration. If heavily accumulated, droppings can plug gutters and cause water damage. Parks, athletic fields, and golf courses are often susceptible to damage from geese. Feathers and feces can foul water and excessive grazing may cause shoreline erosion. 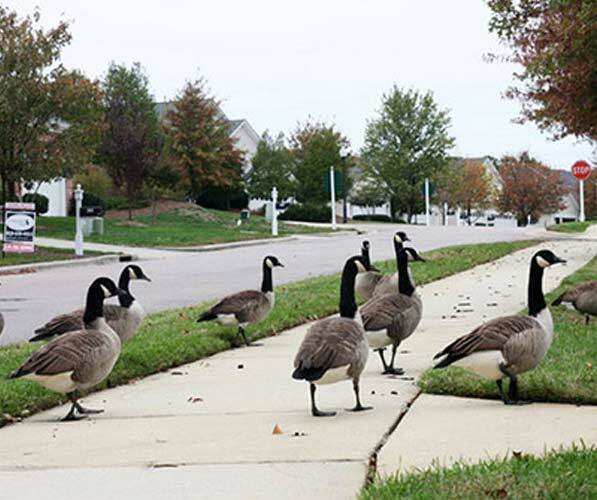 Geese may become aggressive when nesting, and disturb area residents with their honking. Geese should be deterred from airport areas and flight paths for planes. Deer-vehicle collisions are a significant concern especially in areas with high densities of deer and high traffic volumes. 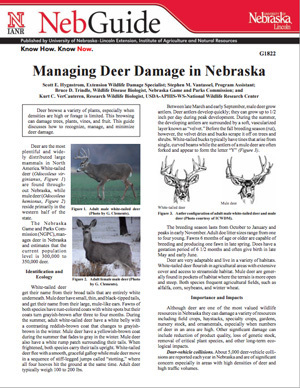 Deer can also cause tree and plant damage as well as transmit diseases to humans. Browsing by deer is identified by the jagged or torn edges of twigs or stems and can occur from the ground up to 6ft tall. Male deer will rub their antlers against trees in the fall, which can kill or severely damage trees. Deer leave heart shaped tracks and have pellet droppings that are around 3/4in long and slightly sausage shaped. 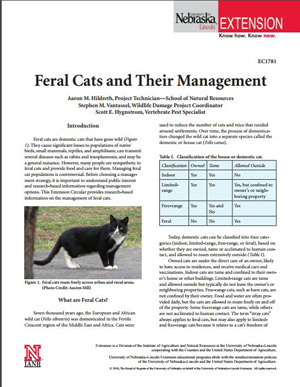 As instinctive hunters, feral cats pose a serious threat to native wildlife, particularly birds. They also may prey on rabbits and rodents. Mice consume and contaminate food/grain, damage structures by gnawing wires and burrowing in insulation, and can also spread diseases. They can also cause plant damage through consuming newly-planted grain or damaging crops before harvest. 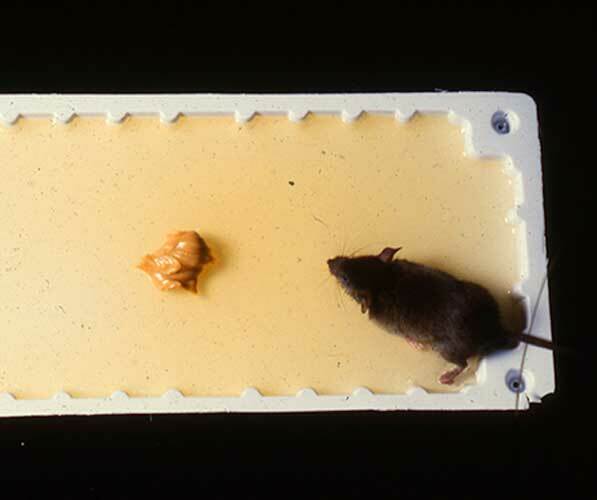 The most common sign of mice invasions is their droppings. Their feces average 1/8in - 1/4in in length and narrow at one or both ends. Mice nests are made of shredded paper and fibrous materials often near heat sources. Another sign of mice is fresh gnaw marks 1/32in wide with clean-cut 1 1/2in diameter holes. They will gnaw cardboard-like objects, electrical wiring, soap, and other items of comparable hardness. 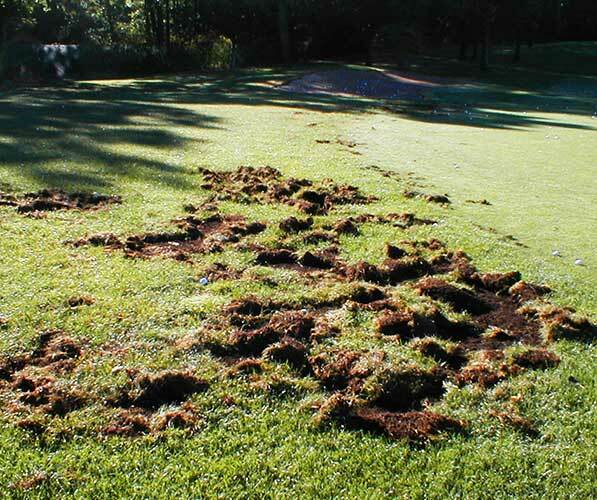 Moles can cause damage to lawns and plants through their mounds and burrows. Plant roots can get disrupted by mole burrows. Their burrows appear as raised ridges in the soil which can wander in no apparent direction or be long and straight. 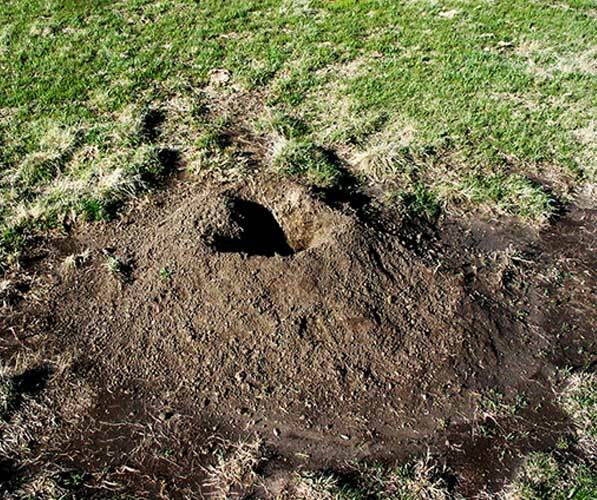 Moles build small, conical-shaped mounds that are less than 1ft in diameter, as opposed to pocket gophers which build large, fan-shaped mounds greater than 1ft in diameter. Opossums are nocturnal animals that eat garden produce and tree fruits. They may also prey on chickens, ducks, pigeons, and eggs. They are not destructive or strong, so they typically enter areas where an opening already exists. Opossums only need a 3in opening in order to enter a structure. Opossums rarely damage lawns in search of worms and grubs. Like raccoons, they also have cat-sized feces, but they do not defecate in the same location every time. 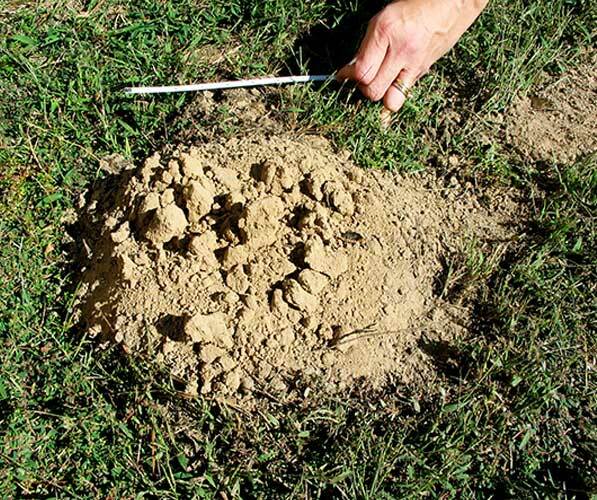 Pocket gophers can be found in alfalfa fields, pastures, rangelands, roadside areas, and backyards. 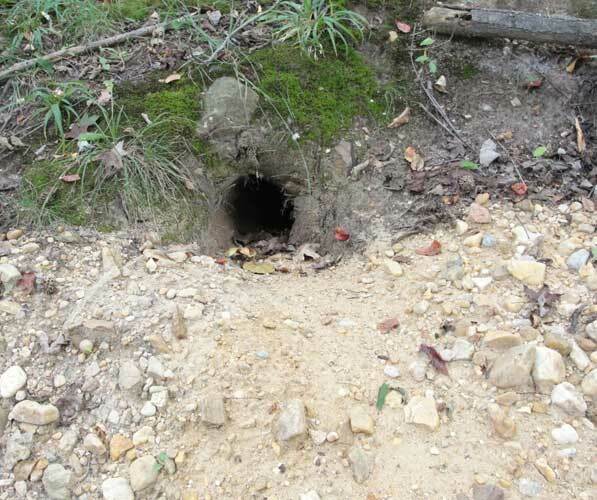 They create extensive burrow systems comprised of feeding tunnels and nest chambers that may cover over 1 acre of land. 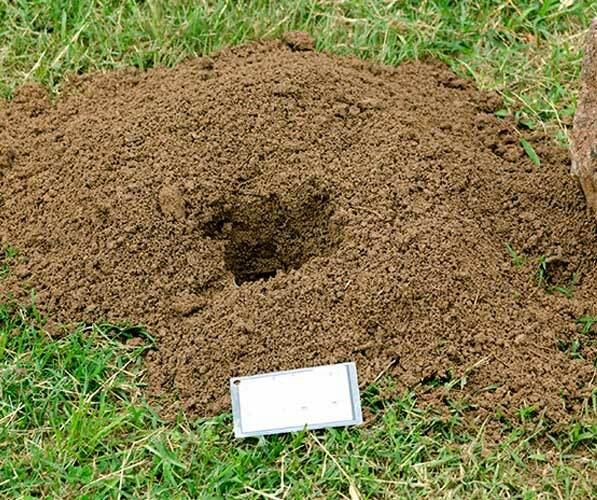 Pocket gophers mounds typically are fan or bean shaped and extend 8-12in across. They are capable of creating dozens of mounds. 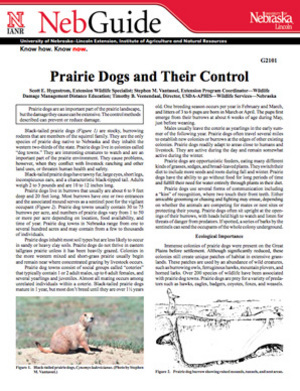 Prairie dogs inhabit the western two thirds of the state. Burrows will have 1 - 2 entrances and are about 6ft - 9ft deep and 10ft - 20ft long. Prairie dogs typically will eat plants less than 1in high. 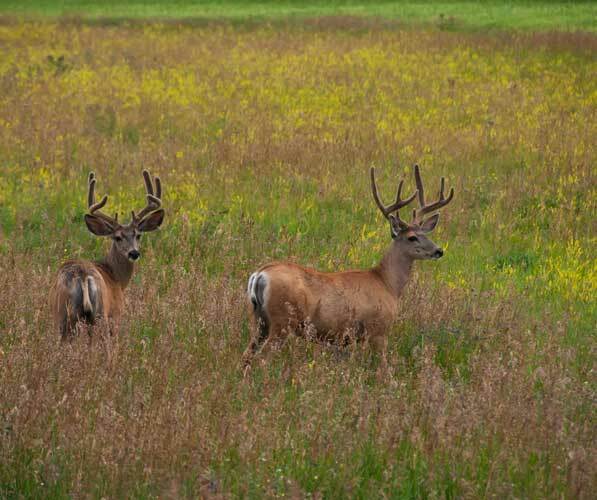 Their grazing habits can interfere with crop production and grazing land for livestock. Some colonies live near houses and subdivisions, where wildlife diseases or animals common to prairie dog towns, such as rattle snakes and black widow spiders, may threaten human health and safety. 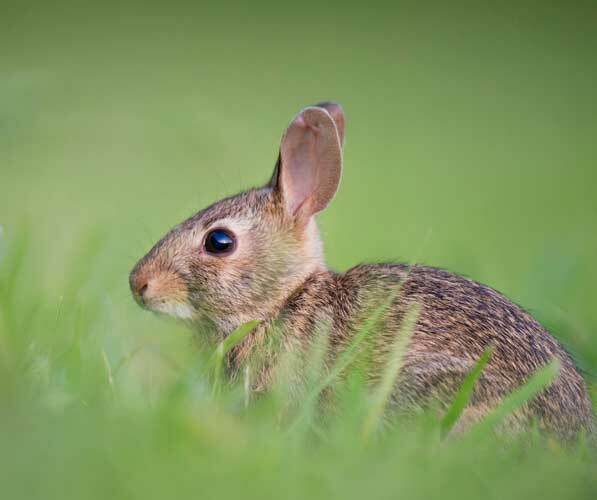 Rabbits damage plants and trees by gnawing bark or clipping off branches, stems, and buds. The most commonly damaged trees and plants include: tulips, sumac, roses, dogwood shrubs, mountain ash, basswood, red maple, sugar maple, apple, cherry, red and white oak, and willow. 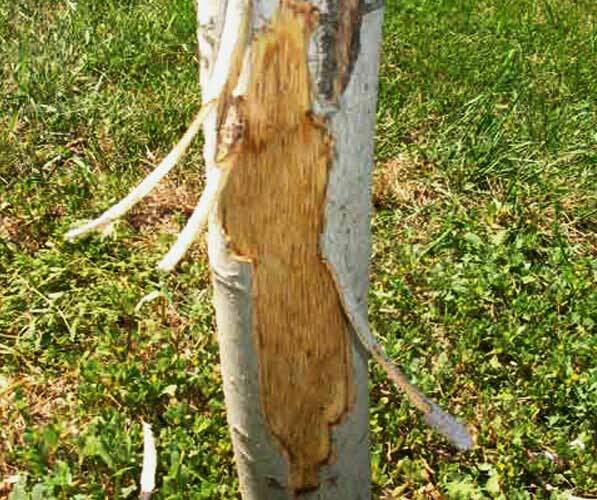 Rabbits gnaw marks will be irregularly placed on tree trunks and shrubs a few inches above ground and occasionally exposed roots. Cottontail rabbit incisors are 1/3 to 3/8in wide. Rabbits will nip pencil-sized stems cleanly at a 45-degree angle. Raccoons live in abandoned dens, hollow trees, crawl spaces, storm drains, attics, and chimneys. 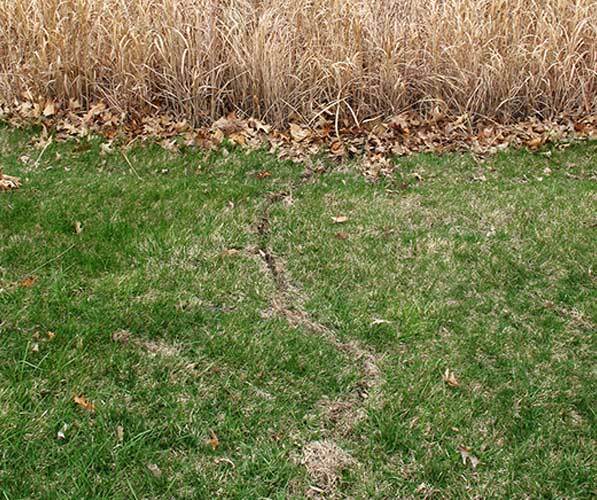 Raccoon damage indicators include: rolled up or shredded sod in the yard, a 4in - 6in hole in the roof, scratches or brown smudge marks on tree or building where the animal has climbed. They can cause considerable damage to crops and gardens, particularly sweet corn and watermelons. Raccoons may also break into coops and eat poultry and eggs. Rats can live in buildings, structures, sewers, piles of debris, heavy vegetation, and clutter. Rats can enter through openings larger than 1/2in in diameter. Den entrances will be 2 to 3in in diameter with the ground worn smooth with use and may have multiple openings, with trails located in less exposed areas. Burrows can damage buildings, foundations, roads, railroads, and banks of canals and levees. They may gnaw on electrical wires, water pipes, doors, windows, walls, ceilings, and floors. 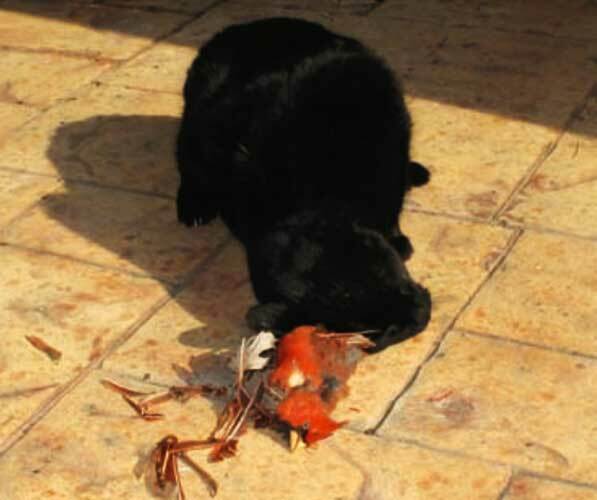 Rats occasionally prey on chickens, ducks, pigeons, and their eggs. 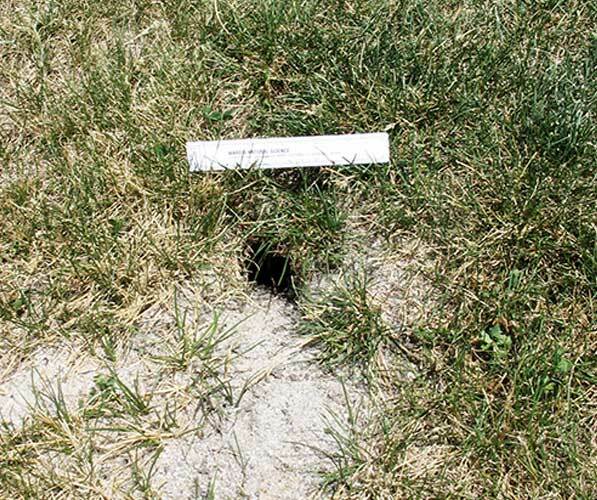 Cone-shaped holes dug at surface of lawn indicate skunks have been digging for grubs and other insect larvae. In addition to insects, skunks may prey upon poultry, eggs, garden vegetables, fruit, bees, nesting waterfowl, game birds, and their eggs. Skunks rarely climb fences, if they can gain access to poultry coops they will mainly feed on eggs. 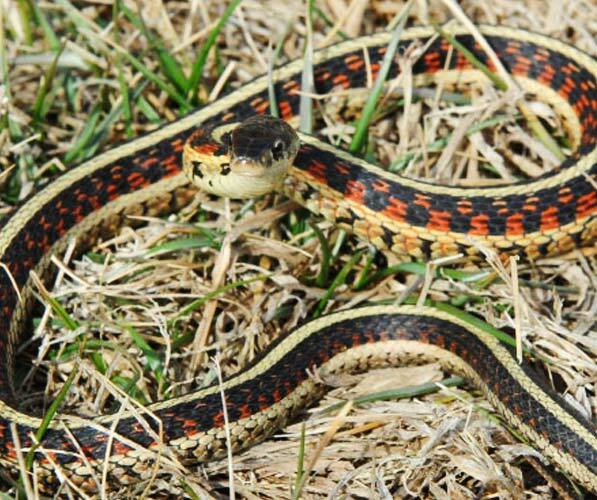 Most obvious sign of garter snakes are snakes themselves. They do not create burrows or holes, they use holes created from other animals. Shed skins may be found in the spring or late summer. Fear of snakes is the most common conflict. 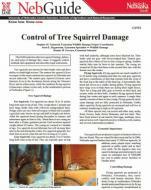 Squirrel damage indicators include: droppings, small holes in yard, gnawed holes in wooden structures, as well as leaves, twigs, shells, hulls, pits, shredded insulation, or nesting materials found inside of a structure. 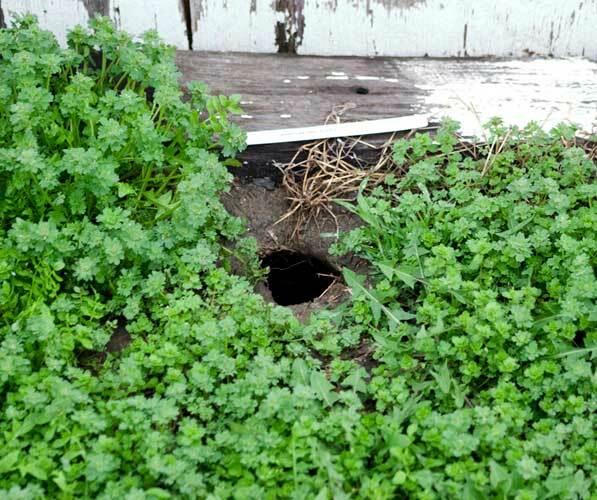 Squirrels can squeeze into holes 1 1/2in in diameter and will enlarge smaller holes by gnawing and can enter structures through vents, chimneys, broken windows, knotholes, and gaps in construction under eaves or gables. They may eat planted seeds, mature fruits, corn, grains, and food intended for birds. Thirteen-lined ground squirrels feed on vegetables and often damage more than they consume. They will dig up newly-planted seeds, consume sprouting seeds, clip shoots of emerging plants, and pull over wheat, barley, and oats to eat the grain. In minimum-tillage fields they will establish colonies, causing significant damage due to their numbers. Their burrows tend to be around 2in in diameter and often have more than one entrance. Mounds are seldom present. Voles can cause damage to trees through girdling, usually in late fall and winter. Marks from girdling and gnawing alone can not identify vole damage, because other animals, such as rabbits, may cause similar damage. Gnaw marks of voles will be irregular in appearance and at different angles. Depending on the type of vole, voles will create either surface runway systems or borrows. Voles may travel in mole tunnels to access flower bulbs and other plant roots. Voles are also known to clip off young plants and dig up seeds. Woodchucks are also known as ground hogs. They may damage vegetables in gardens, strip fruits from tree limbs, or damage/kill trees. 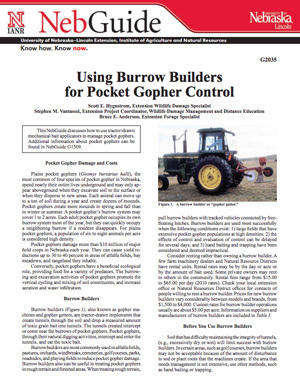 Woodchuck burrows may undermine building foundations and be a hazard for field equipment or livestock.